Unlike a few decades back when traditional knobs on doors were the only security feature that you needed, the scene has totally changed these days. Even if you have a high-tech security alarm system at home, it can be disabled by criminals using their tools of the trade. If you would like to minimize the possibility of thieves breaking into your home, it is entirely up to you to make sure that the locks are properly and securely placed. What Types of Locks Can I Choose from? Unlike other parts of the house which are locked for security purposes, bathrooms are locked for privacy purposes. This means that an internal locking mechanism is all you need, and there are plenty of products from hardware stores that you can use for that. We definitely live in uncertain times today and that is why the minimal security feature that you would need for your front door is a deadbolt and a cylinder lock. For homes in other crowded cities, there are even apartment doors which have a handful of locks simply because the threat of breaking in is always present. With a deadbolt, you can make sure that it will be pretty difficult for criminals to force their way inside. Chosen for both their security and aesthetics, rim locks come in a variety of finishes. Take your pick from polished chrome, satin chrome, plain grey, black, metal or electro bass colors. Finally, you can go for one of the most popular locking options these days which are sash door locks. They’re rust-proof, fire-resistant and are made by top lock and key manufacturers like Chubb, Yale, ERA, Ingersol and Union. 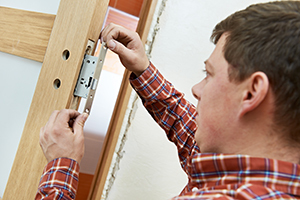 Choose a door lock based on where you are planning to install it and the level of security that you need.